Tiring of using mouse & keyboard with your CAD design? Do you wish to experience a better way to perform intricate adjustments to camera views and models without repeatedly stopping to change directions, zoom or rotate model. 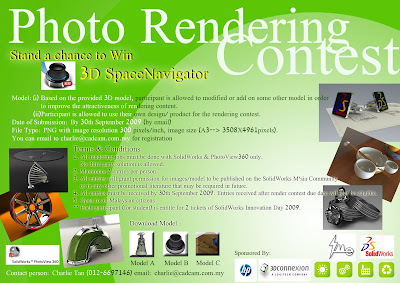 Here you are welcome to grab the chance to win 3D SpaceNavigator! In conjunction with SolidWorks Innovation Day 2009, IME Technology Sdn.Bhd. has organised a Photo Rendering Contest to cultivate the interest of doing photo rendering in 3D. You can either use the existing model provided by the organiser or you can design your own model and render it with either PhotoWorks or PhotoView360! Don't worry about lack of idea to perform your design, I believe for those CAD lover, you may have the interest to build your favourite character after you enjoy the movies such as recently we have Transformer, G.I. JOE, Harry Porter and so on. Come on! Use your interest to win something! Thanks for support! Wilson! You are encouraged to contribute in this blog as well if you have any idea or design that you want to share~just feel free to voice out! By the way, Are you my student? hey~ why not consider to participate the rendering contest? is very easy!